Other presidents and vice presidents have visited the Demilitarized Zone -- the DMZ. The zone divides South Korea, a democratic country, from North Korea, a communist state. But how was the DMZ established? Here is a backgrounder, along with links for further study. Early relations: Diplomatic relations between Korea and the United States were established under the 1882 Treaty of Peace, Amity, Commerce, and Navigation. The first U.S. diplomatic envoy arrived in Korea in 1883, according to a history on the U.S. State Department website. In 1910, Japan began a period of colonial rule over Korea, the website adds. That ended in 1945, as World War II concluded with Japan’s surrender. The Korean peninsula was divided at the 38th parallel into two occupations zones, with the U.S. in the south and the Soviet Union in the north. The goal: This division wasn't supposed to be a permanent solution. An independent Korean government was to be established. But the advent of the Cold War strained relations between the U.S. and the Soviet Union, and many Koreans became anxious. 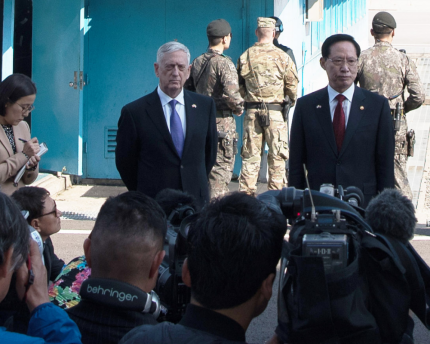 “The lack of progress toward Korean independence does more than all else to nullify good will toward U.S. forces and trust in our nation’s motives,” warned a classified message from the U.S. military in South Korea. Soon, there was a breakdown in negotiations over a unified government. Unable to form a unified Korea, two separate nations were established in 1948. The Republic of Korea was established in the south, and the Democratic People's Republic of Korea in the north. The Korean War: North Korean forces, backed by the Soviet Union, invaded South Korea on June 25, 1950. A United Nations coalition, led by the U.S., defended the South, and a clash ensued between communist and free-world forces. China entered the war on behalf of North Korea later that year, the State Department account explains, and “a stalemate ensued for the final two years of the conflict until an armistice was concluded on July 27, 1953.” While there wasn't a peace treaty at the end of the war, the U.S. and South Korea signed a mutual defense treaty. The treaty declares, "Each party recognizes that an armed attack in the Pacific area on either of the parties ... would be dangerous to its own peace and safety and declares that it would act to meet the common danger in accordance with its constitutional processes." The “truce village” of P’anmunjŏm is within the DMZ. Today: Led by Kim Jong-un, 33, North Korea's burgeoning nuclear bomb program continues to unsettle the region. The United States and North Korea do not have diplomatic relations. South Korea is among the five countries with the largest active-duty U.S. military presence, according to the Pew Research Center. In 2016, were 24,189 U.S. personnel stationed in South Korea. Various press accounts give a slightly higher number. Asia Society.org: Korean History and Political Geography. CIA World Factbook: North Korea. Encyclopedia Britannica: Demilitarized Zone – Korean peninsula. Harry S. Truman Presidential Library & Museum: The Korean War and its Origins. Lonely Planet: The DMZ Tour. Pew Research Center: U.S. active duty military presence. U.S. Army: The Korean War -- The U.N. Offensive. U.S. Department of State: U.S. Relations with the Department of Korea. Yale School of Law: Mutual Defense Treaty Between the United States and the Republic of Korea; October 1, 1953.